The scale of Christopher Nolan's work continues to expand, but his latest release Interstellar proves that this is by no means a good thing. The set-pieces and visuals may impress but this is a convoluted piece, unsure of the story it wants to tell. With drought and famine making earth almost uninhabitable, NASA send a group of astronauts on a mission to find a suitable new home for humanity. However, none of the crew are prepared for the effects that this journey will have on each of their lives. Nolan's ambition is admirable and when paired with an estimated budget of $165m, the world should be his oyster. The end result, however, is staggeringly mediocre. Straddling a multitude of different story-lines Christopher and brother Jonathan Nolan's screenplay never quite seems sure of the story it wants to tell. By splicing family drama with space-adventure and several ambiguous dimension-sprawling subplots, Interstellar is an uneven watch that attempts to check all the cinematic boxes imaginable - in doing so there is the odd moment of emotional poignancy, the occasional thrill and rare innovative moment. Bogged down by rigid scientific jargon and unfulfilled themes (the finale's 5th Dimension subplot, mostly), Interstellar for the most part is a slog. Given the vast 169 minute runtime, as expected there are some tremendously strong moments to behold in Interstellar. Nolan's visuals remain awe-inspiringly beautiful - especially when crafting the untouched magnificence of alternative planets. A sequence on a water-logged world with several staggering tidal waves is a high point of the feature where Nolan executes a high-octane tension paired with sheer visual might. The middle-act which introduces Matt Damon's character is equally impressive and is as close to deep character development that we get in Interstellar. These space-exploration sequences showcases the film's strongest emotional nerve - by presenting the concept that one interplanetary hour is the equivalent of 7 earth years - Nolan provides some poignant moments. Given the initial family dynamic crafted in the first act, there are several emotionally-raw sequences presented through the astronauts receiving years worth of messages from home in the space of minutes. Despite these impressive visual set-pieces and stirring displays of emotion, Interstellar never truly immersed this reviewer. Unlike other recent space-epics Gravity and Prometheus, Interstellar's clunky jargon-heavy narrative and continual tonal shifts prevent us from ever being enveloped in this world. 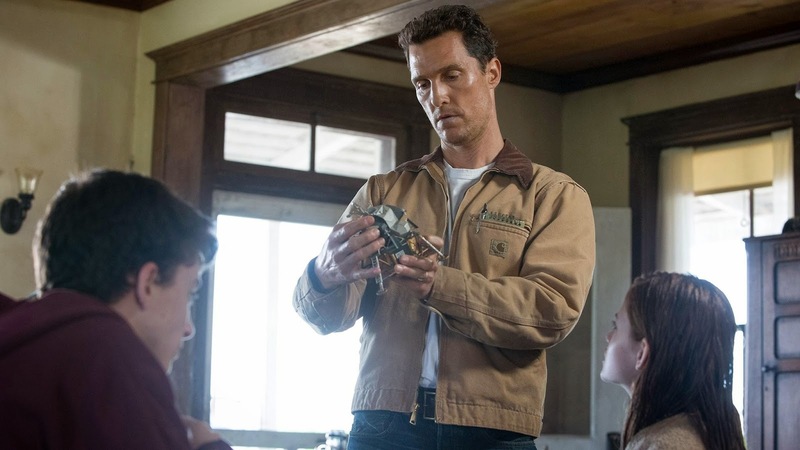 An impressive cast ensure that Interstellar remains watchable and convincingly sentimental throughout. Matthew McConaughey is reliable lead with the right blend of gung-ho enthusiasm and vulnerable humanity to connect with viewers. Anne Hathaway remains a charming screen-presence, despite awkwardly having the same haircut as co-star Wes Bentley. Top notch support comes in the form of Matt Damon, Michael Caine, John Lithgow, and Jessica Chastain. Perhaps the victim of its own hype, Interstellar is Nolan's most surprisingly average release. Despite an undeniable visual might, occasional well-judged moments of emotion, and a game cast, Interstellar unfortunately gets bogged down in its multitude of narrative tangents, rigid scientific-thematics and drawn-out attempts to innovate.